JEFF GOLDBLUM IS JAZZ NO. 1! 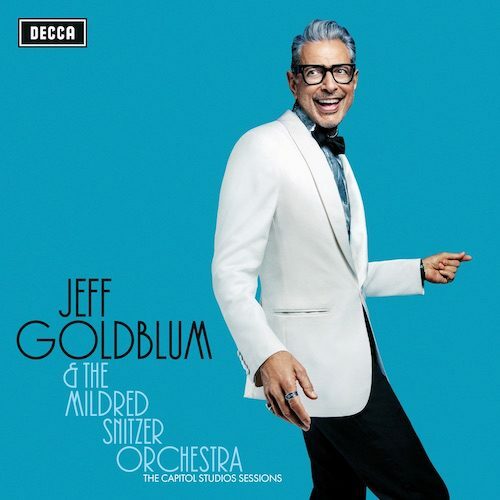 16 November 2018 (Toronto, ON) - On the eve of his first ever UK live show, Hollywood icon Jeff Goldblum, along with his long-time band The Mildred Snitzer Orchestra, celebrate hitting the top spot of the UK Official Jazz & Blues Albums Chart with their debut LP, The Capitol Studios Sessions, released November 9 via Decca Records/Universal Music Canada, the country’s leading music company. Listen to The Capitol Studios Sessions HERE. Goldblum has been playing the piano all his life and performing with his jazz band for the past 30 years, but it was only when he accompanied soul-jazz star Gregory Porter on BBC’s Graham Norton Show last year that the actor’s distinctive style and natural feel for the piano caught the attention of Decca record executives, who suggested he make an album. On November 17, Jeff and The Mildred Snitzer Orchestra play their first London gig, which has proved to be the hottest ticket in town. Selling out in minutes, it is one of four shows (with an extra performance added due to high demand) at Cadogan Hall and Ronnie Scott’s as part of the London Jazz Festival, with additional live dates in Paris and Berlin. The atmosphere and energy of these shows is captured perfectly on the record. Produced by Larry Klein (Joni Mitchell, Herbie Hancock, Madeleine Peyroux), The Capitol Studios Sessions is the realization of this idea: jazz and standards presented in a manner that dares to be high-spirited and to make you feel good. Along with Irish superstar Imelda May, American singer Hayley Reinhart and comedian Sarah Silverman on guest vocals, Goldblum and his band deliver the feel and the swing, and they make it fun, funny, and familiar. Those are words not often associated with jazz, though they still can be, and today with this No.1 album, we are reminded of that.